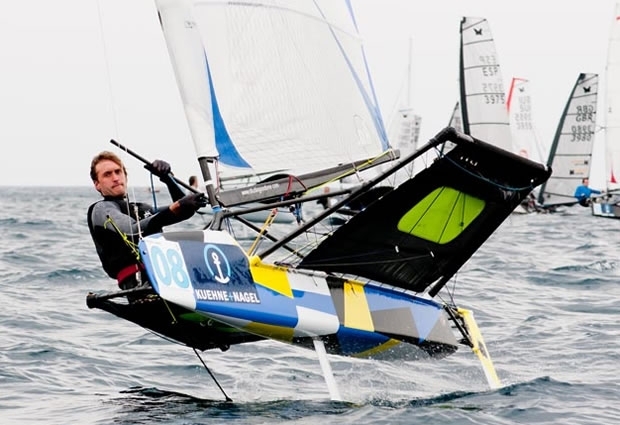 6/8 knots of wind, sun and sea - one race was held in the morning at the Kuehne & Nagel International Moth Europeans in Masala, Sicily, but the wind continued to not play ball on a day when the British crews would have liked to confirm their superiority and in which the Swiss could have redeemed themselves. This, the third race of the series was won by Hyde Sails Technical Director, Mike Lennon, breaking the run of two bullets by Chris Rashley. However Rashley came home second to retain the overall lead as these two extend away from the rest. British sailors now hold the top five spots with Tom Offer up to fifth place. Sadly after this the breeze did not settle and the race committee sent the fleet in to wait for more wind, until racing was cancelled for the day at 1600 and it was a class of retiring to the bar to listen to Stefano Rizzi's war stories from the Volvo Ocean Race, Olympics and America's Cup.